Let’s imagine that a B2B company has an enewsletter it sends to its X-thousand- person list. The enewsletter has an open rate of 36% (very good) and a click-through rate of 12% (even better). The company is thrilled with the results. After all, their email marketing stats are well above industry averages, indicating lots of interest and lots of sales, right? Well, not typically. In fact, upon closer examination it would not be uncommon to find that the vast majority of recipients on the list are not customers, have never been customers and will never be customers. The enewsletter’s content is likely too general to trigger a sale, and it’s going to take many, many, many more impressions to even get close. The prospect criteria is too broad, and therefore, those on the list have been poorly qualified. So, while the company is very pleased with its “great” results, in reality, these are wasted impressions. Now let’s imagine a different B2B company – one that is using Account-Based Marketing (ABM), an approach based on identifying select valuable accounts and targeting them directly in a highly personal and relevant manner. Because the company is using ABM, it is not trying to reach a general audience, but rather is targeting carefully selected companies and individuals at those companies who play a part in the decision to buy. Additionally, because this company subscribes to the ABM approach that advocates for a full alignment of marketing and sales, both its marketing and sales teams work together to target those select accounts, sharing strategic insight and collaborating for continual improvement. Although ABM has been around for some time, what makes today’s application especially exciting is the personalization component – and, more specifically, the automation of the personalization component. The sales team at the pursing firm takes the decision makers at an identified target company out for a round of golf and fancy dinner. The marketing team at the pursuing firm sends the decision makers at the identified target company a personalized report about a challenge their company is facing, using real information about the company. When the decision makers at the target company go online to check out the pursuing firm’s website, they see a message that’s directed specifically to them – possibly even personalized with their company’s name. And, of course, the firm is using the same process and automation to reach out to nine other target accounts. While certainly there might be golf and dinner in store for a few of these accounts, you just can’t play 10 rounds of golf a day, but you can send 10 very personal reports. And you can personalize your website to show the right message to each prospective company. Real-time, personalized communication effort, with time invested only on those accounts that have been prequalified and deemed valuable, is likely to pay off. Your company stops spending valuable (and limited) resources on wasted impressions that don’t result in growth or increased revenues. Even better, as you learn which targeted accounts yield the highest returns, you can refine your focus, further improving your ROI. ABM only works for companies that know the exact organizations or types of organizations that are likely to generate revenue. They typically target just a few large accounts or accounts with shared attributes with a proven high value, such as industry, geography or revenue/size. 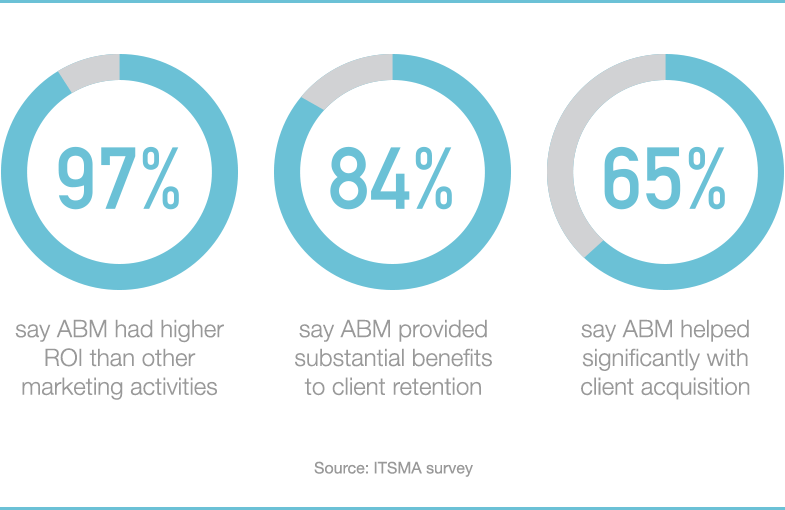 ABM could also work exceptionally well for companies with small marketing budgets where there’s no room for waste. This is because marketing broadly requires significantly more reach and frequency to generate results – and reach and frequency cost. Perhaps you are connected to 500 people on LinkedIn, and of those connections, 10 work for organizations that represent your ideal target account. You could build and maintain relationships with all 500 of your connections, but it’s unlikely you could be personal and relevant enough to attract and win over the 10 you really want. But what if you put 100% of your effort and resources into just those 10 highly qualified, revenue-valuable prospects? Seems only logical to do so. At Substance151, we assist companies in developing strong brands and marketing programs that connect with prospects in powerful ways. Contact us at 410-732-8379 or brand@substance151.com and let’s discuss how we help you create a highly personalized prospect experience that generates higher returns.